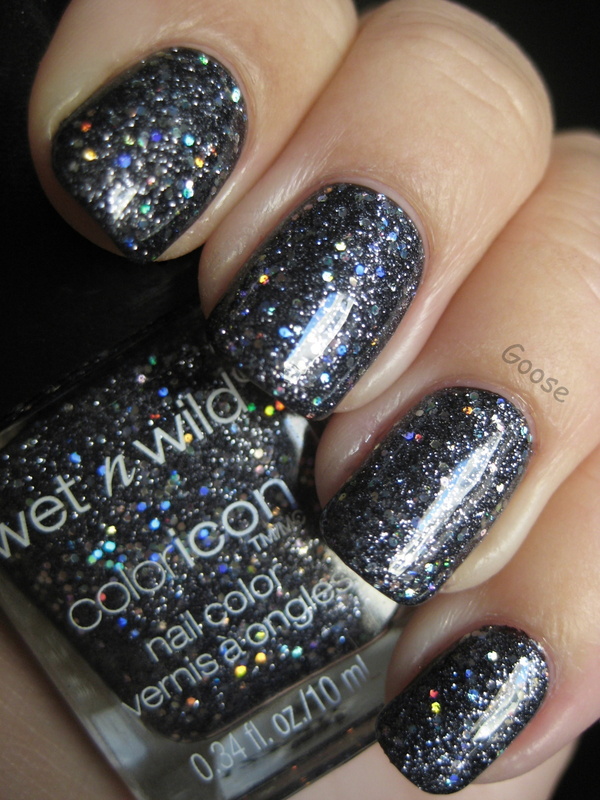 Yet another beauty from the Wet'n'Wild Ice Baby collection (Coloricon): Diamond in the Rough. This time I decided to layer the glitter over a solid color. I used one coat of Zoya Raven (doesn't matter if there are slightly bald spots - they're covered by the glitter anyway) and two coats of Diamond in the Rough. As it turns out, I kind of think it has more depth at only one coat, which is what I did on my other hand (not shown). It looks pretty much the same color (maybe a tiny bit darker, but not really noticeable), but for some reason, one coat of the glitter seems to have more "depth" than the two coats. It's also smoother and less "lumpy." This one is either very close or a dupe for China Glaze Some Like it Haute, Sally Hansen Glitz Gal, and Nails Inc Sloane Square. Some of those may be a little easier to find since this was limited edition, though a tad bit more expensive. I *really* like this glitter! It's annoying that we can only buy the more boring versions of Wet N Wild here. WOW. That's all I can say. I need this. Ohhh this is very pretty! I have yet to try my Diamond in the Rough! I need to soon!